Hero Histories: Video Fridays: THE GREEN HORNET in "Beautiful Dreamer I & II"
Video Fridays: THE GREEN HORNET in "Beautiful Dreamer I & II"
Since The Green Hornet was a weekly show, rather than twice-a-week like Batman , the producers wanted to avoid two-part or continued stories. However, whether the original concept was to do an hour-long show, or the story editors were unaware of the edict when they solicited scripts, there were several shows that ran an hour. Peter Eden is a criminal posing as the owner of a health spa to the rich and famous called The Vale of Eden. Using subliminal motivation via "sleep teaching" to make his clients steal from their own companies and families, turn the loot over to him, and then forget all about it, he's created the perfect method to commit crimes and let others take the blame. It's also the only episode we see The Hornet and Kato's gas masks (which they just test, but not use). 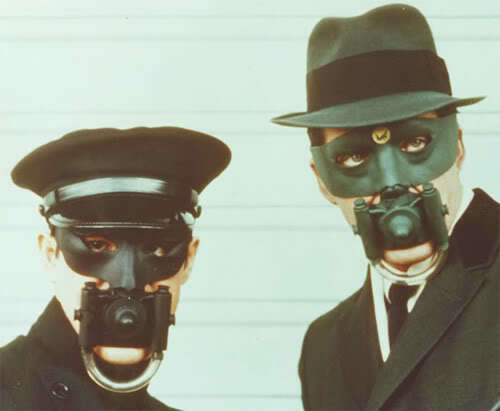 Considering how often they use gas, either from the Black Beauty's grille-gun or the Hornet's pistol, I'm surprised the masks weren't seen more frequently. You'll note in the photo above they're also color-coordinated for the Hornet (green) or Kato (black/midnight blue). There's lots more location shooting since the finale involves stealing the proceeds from a racetrack and the duo, in Black Beauty, pursue Eden's henchmen in an armored car all over the place; thru the stables and onto the track itself! Here's the SEVENTH and EIGHTH broadcast episodes "Beautiful Dreamer I & II" in six segments. There's no "teaser" for part 2 at the end of part 1, and no "synopsis" of part 1 at the beginning of part 2, which starts at the opening credits with no pre-credits sequence. They do exist, and I got them on audio tape, when I recorded them off tv in the days before VHS and DVD. The syndicated prints that HronetsNes1000 digitized his files from probably omitted them since most stations ran the 26-episode series as a one-hour block once a week, thus the preview and synopsis were unnecessary since the eps ran back-to-back, and by leaving them out, a couple of minutes of commercials were added without cutting into the episodes themselves.